When remote users complain about slow Citrix performance, is it due to their network connection? Problem: The Operations team at a large professional services firm was inundated with support tickets, and needed a way to quickly determine if reports of slow performance were due to client-side network issues. Desired Outcome: Valid complaints about slow Citrix or application performance needed to be resolved quickly, while avoiding time spent troubleshooting network congestion and connectivity issues. Solution: The Operations team built a dashboard in ExtraHop that not only revealed poor user experience, but also showed if the root cause was due to client-side network issues. User Impact: By providing Tier-1 support staff with a real-time runbook on how to triage client-side connectivity problems, the Operations team reduced support escalations from remote users by 40%. Load Balancer Optimization in solutions. An Operations team supporting Citrix at a large professional services firm frequently received complaints about slow response times from the field. Even though the team knew that the root cause of poor performance for remote users was frequently outside of their control, they still needed to investigate the Citrix environment and the applications delivered over Citrix. This process was time-consuming but necessary as users in the field relied on these Citrix-published applications to get their jobs done. To streamline the triage process, the Operations team needed to be able to quickly identify and resolve performance issues that were within their control. Ideally, they would be able to empower Tier-1 support staff to triage issues so that they only escalated the problems that the Operations team really needed to know about. Ability to quickly determine whether slow response times reported by end users were due to poor Citrix performance, application issues, network congestion, or other problems. Reduce the number of unnecessary support tickets. Improve productivity for the Operations team. Even though the team knew that the root cause of poor performance for remote users was frequently outside of their control, they still needed to investigate the Citrix environment and the applications delivered over Citrix. Using the ExtraHop platform, the Operations team built a dashboard that revealed at a glance which users were experiencing network issues as opposed to Citrix or application issues. The dashboard also functions as a runbook so that Tier-1 support personnel know when to escalate an issue to the Operations team, such as when round-trip time for a particular user IP exceeds 1000 milliseconds. 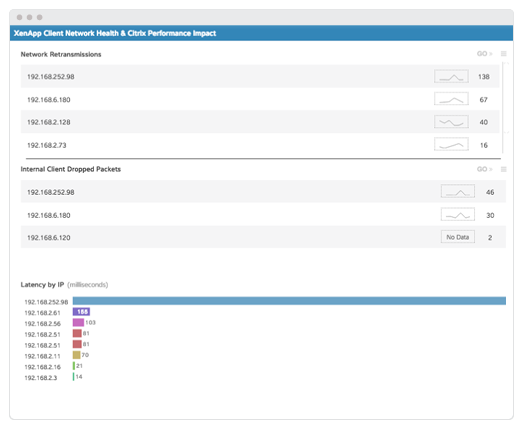 The metrics on the dashboard enable the Operations team to track common network metrics that can indicate network congestion or connectivity issues, including: high retransmission counts when users access Citrix applications; client connections with high network error rates; packet drops by the client; and latency by IP and user. Equipped with this visibility, the Operations team could see that a user with the IP 192.168.252.98 was experiencing slow Citrix response times due to their network connection. They could easily verify that ICA load times exceed SLAs for this client IP, but also that network failures (send window throttles, in particular) were causing this slowness. Investigating further, the team found that their VPN concentrator was functioning normally and were able to conclude that the poor performance was due to external connectivity factors. With the ability to triage performance issues reported by remote users, the Operations team was able to eliminate time spent unnecessarily investigating Citrix and application performance. By equipping the Tier-1 support staff to understand when an issue needed to be escalated, the organization also reduced the number of support tickets for the Operations team by 40%.